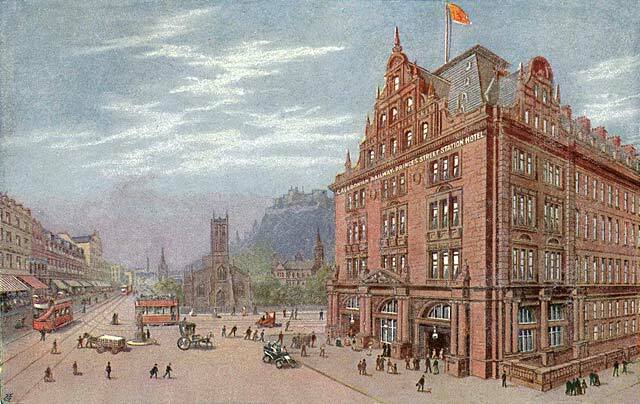 The magnificent, pink Permian sandstone Caledonian Hotel, Edinburgh opened in December 1903, to offer a taste of opulence from décor to hospitality. The Telegraphic address was simply “Luxury Edinburgh”. After a lavish re-design, the hotel was launched anew as the world class, 5 star Waldorf Astoria in 2012 reflecting the glamorous art deco ambience of the original Railway Hotel. The old station clock hangs in the magnificent, glass-roofed Atrium, Peacock Alley, the place to see and be seen for morning coffee, a light lunch, champagne, cocktails and traditional Afternoon Tea. 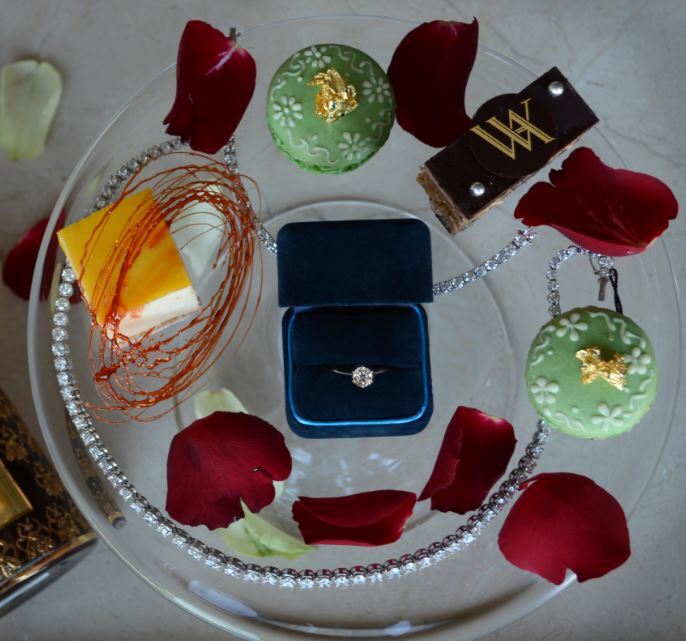 A dazzling Diamond and Pearl themed Teatime has been created to celebrate Valentine’s Day. To add authentic sparkle, Laings, the famous jewellery company has been the inspiration for this event as well as VIP diamond-themed weekends with champagne and special gifts. The partnership between the Waldorf Astoria and Laings is the perfect match, both sharing a sense of traditional heritage oozing the epitome of luxury. 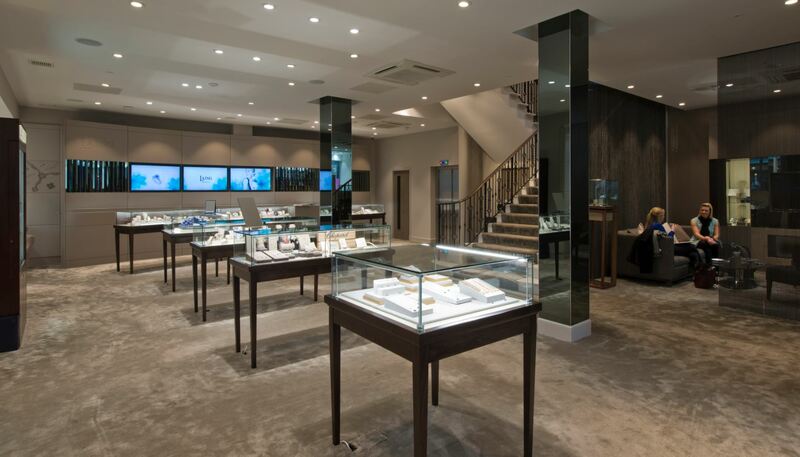 Established in 1840 by two brothers James and William, Laings is Scotland’s oldest family jeweller, with a collection of boutiques for memorable birthday and wedding gifts as well as bespoke diamond Engagement rings – a girl’s best friend! 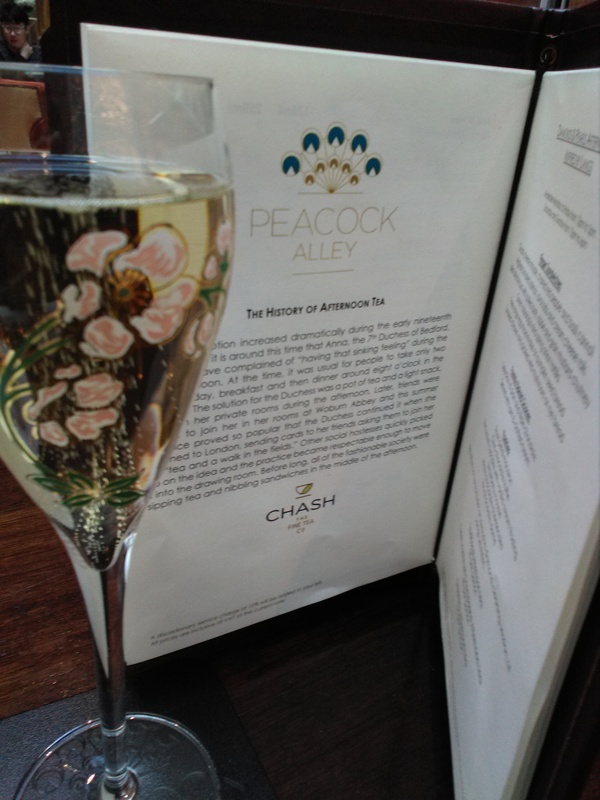 And so with a Springtime mood of Love in the air, on a cool February day, my partner Ken and I arrived at the Peacock Alley to experience this sparkling Afternoon Tea. Sitting in huge comfortable armchairs, the ambience is elegantly casual with soft music on the soundtrack. The table is set with white crockery, silverware and crisp white linen napkins, wrapped in a Laings blue silk ribbon. 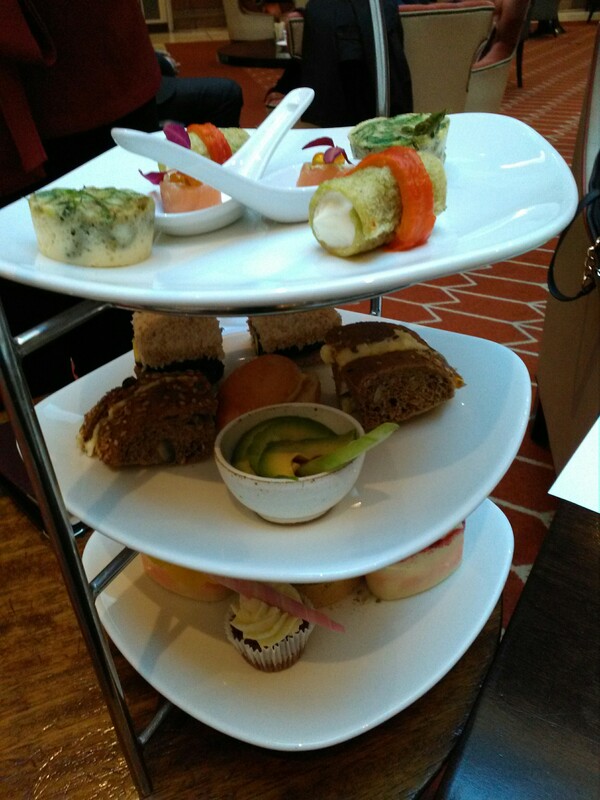 We are presented with menus packed with information on the wide choice of teas, finger sandwiches, pastries and cakes. Our waiter than offers a glass of Perrier Jouet Champagne, served from a neatly designed drinks trolley. The unique PJ Champagne bottles and the pretty flutes are both hand painted with pink and white flowers, which are simply fabulous. I select the fragrantly smoky Lapsang Souchong tea while Ken is keen to try the Peacock Alley, Waldorf Astoria’s own blend, a secret combination of teas, fruit, spices and herbs. Both are most refreshing and full of flavour. Then a tall sandwich and cake stand arrives featuring a wonderful array of sweet and savoury treats – Goat’s cheese mousse & red pepper cannoli, Smoked salmon and avocado, Asparagus and green pea torilla, Smoked chicken and mushroom on rye toast – all deliciously light canapes for a contemporary-styled Afternoon Tea. Tradition is preserved with Scones, (rather too large!) with thick clotted cream and strawberry jam. Another cup of tea is poured as we slowly move on to the colourful cakes. First a tiny white frosted Red Velvet Cupcake: the Waldorf Astoria, New York City claims it is the birthplace of the iconic Red Velvet cake, a popular menu item from the 1950s, (although research reveals the original flavour was invented in the 1920s by the Adams company). 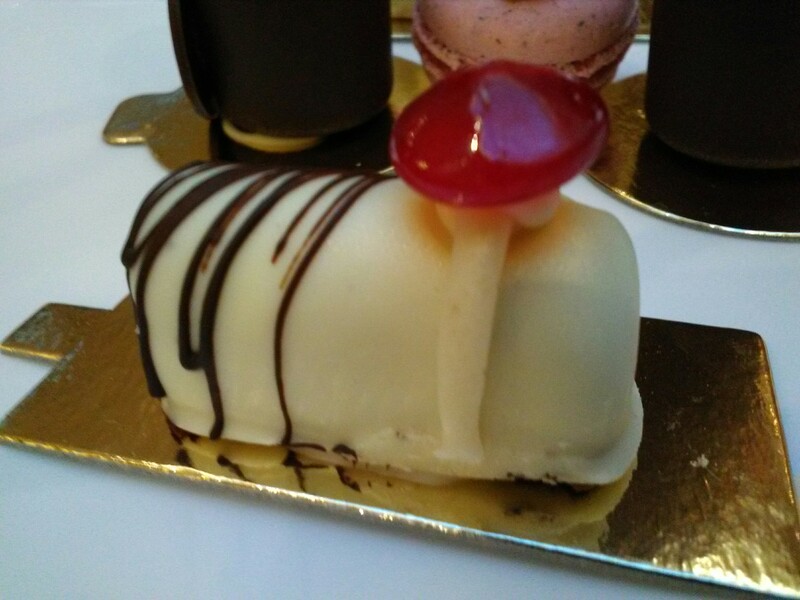 Chocoholics will be in heaven when sampling the selection of artistically decorated pastries, from white chocolate cheesecake to a triple chocolate dome. The Oreo Chocolate Truffle is wrapped in a sugar-coated, (edible), red Ruby ring to reflect Laings gorgeous gems and jewels. As part of the “Diamonds & Pearls” event, all guests are given a voucher for an exclusive diamond cleaning session at one of the Laings stores. While there, you can view the range of jewellery and watches covering the most famous, fashionable global brand names from Rolex and TAGheuer to Cartier and Chanel. Over three hours, we nibble little egg sandwiches and taste rose petal macaroons, sipping delicious tea, and an indulgent flute of ice-cold Perrier Jouet champagne. 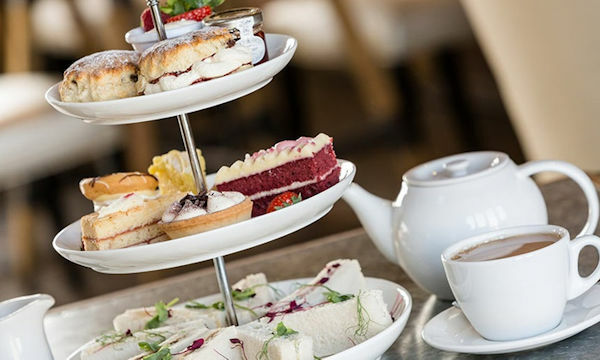 Gracefully served, Afternoon Tea at the Peacock Alley is the perfect opportunity to meet family and friends (or of course your loved one) for a leisurely and relaxing sociable experience. This joint venture to celebrate Valentine’s Month is an imaginative concept. The ethos of Laings is based on the fact that everything they do is for a memorable occasion. Likewise at the Waldorf Astoria, where the fine hospitality revolves around exemplary wining and dining from the cocktail bars and Galvin Brasserie de Luxe to the Pompadour Restaurant. Following the romantic connection, Weddings are also a key speciality!. 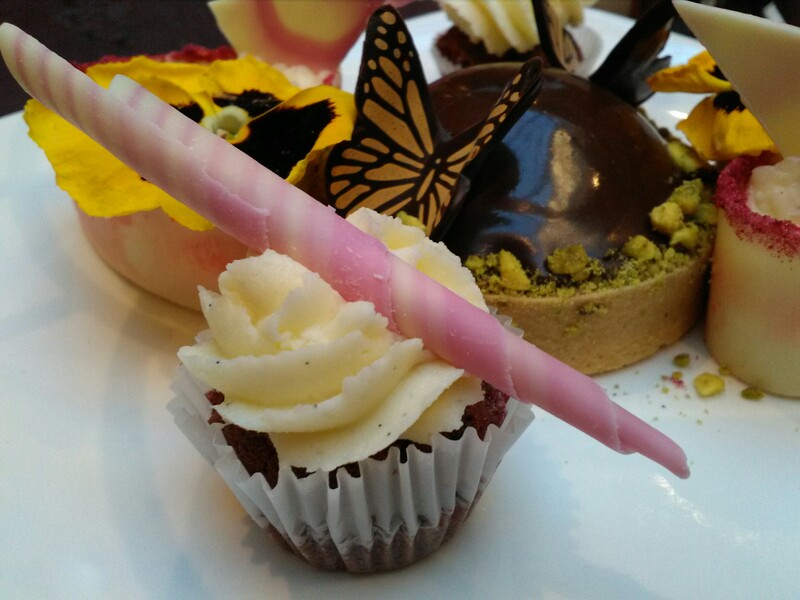 Diamonds and Pearls Afternoon Tea: 9th – 28th February 2018. 12 noon – 5pm. £45 per person. 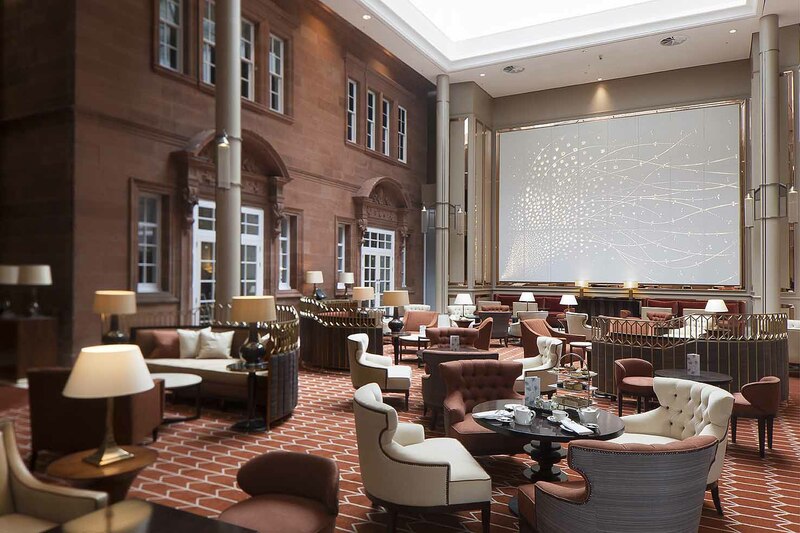 A luxury, romantic weekend break – caledonian.reservations@waldorfastoria.com. (also in Glasgow, Southampton and Cardiff). 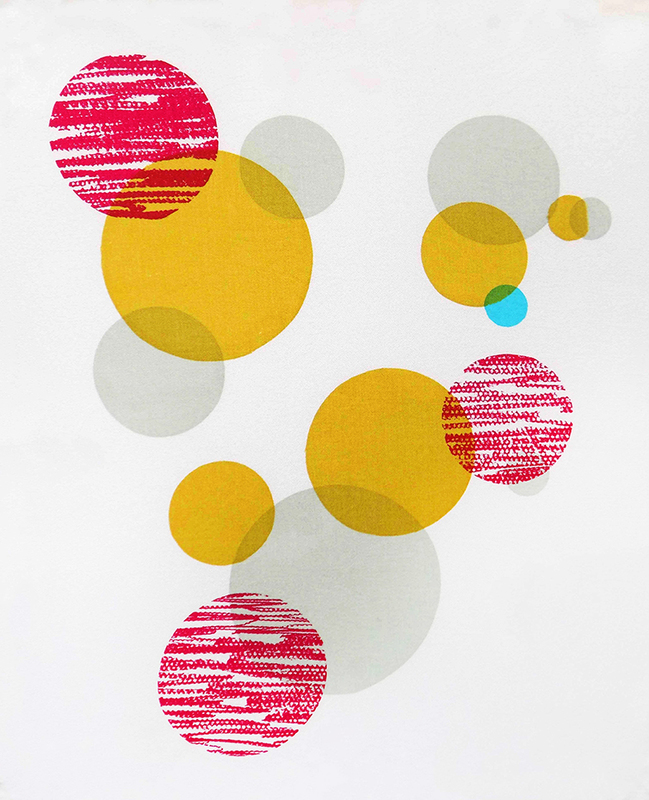 The Upright Gallery overlooking the Meadows at Bruntsfield was founded around a year ago by graphic artist and designer, Ian Farmer, and specialises in a diverse selection of contemporary art. 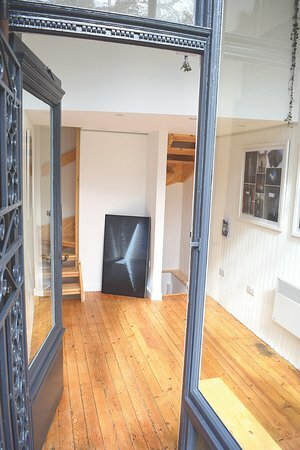 This tall, narrow, split level townhouse, previously an Antique shop, has two exhibition spaces with open staircases to allow the light to flood in from the high windows. The narrative focuses on the purchase of an expensive white canvas which its proud owner Serge is unveiling to his friends Marc and Yvan. Is it beautiful or just blank? Pure white or with a touch of grey, perhaps a vague stripe? In their heated debate over this abstract painting, the ingenious play is a masterpiece in itself as it questions the role of the artist, the essential value and meaning of art. 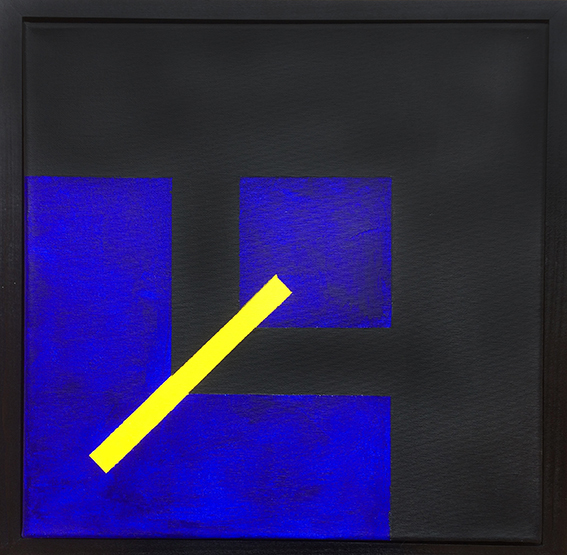 The current exhibition at Upright entitled Re:Colour – Re-Shape showcases the work of two artists who specialise in Abstract art. On the ground floor are the impressive paintings in both monochrome and bold colour by Ian Frank. 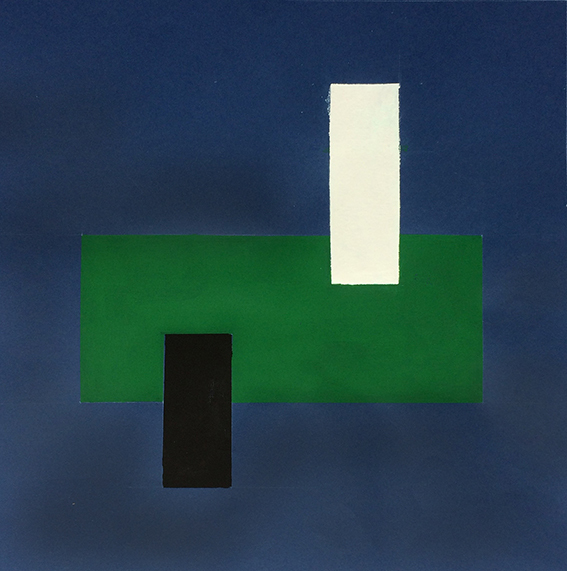 At first glance they appear to be a deceptively simple series of squares and rectangles but as a former architect, these are based on geometric shape and precise proportions. 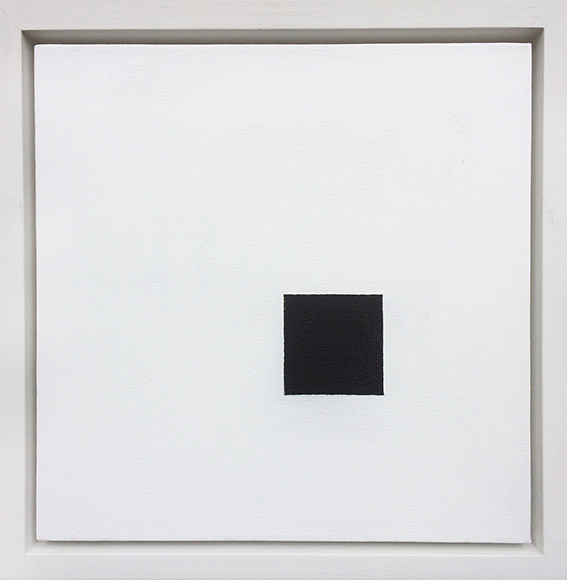 A group of minimalist monochrome works include “Black Square on White” and “White Square on Black” is a delightful double act, to be purchased together. Developing this theme, “Exploding Square” is a delicate paper-craft, origami style, bursting open like the bud of a flower. 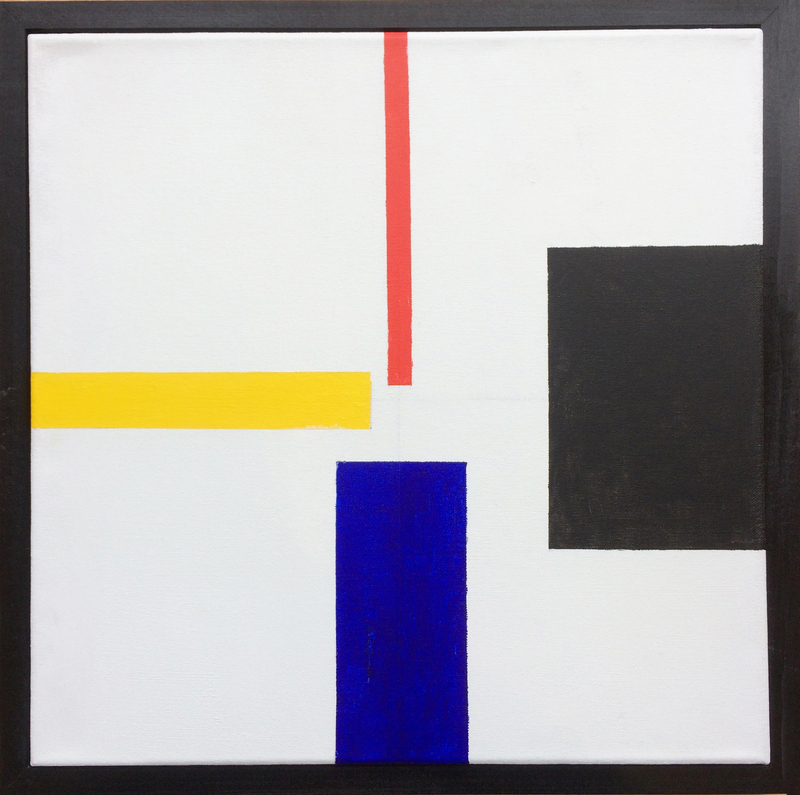 Another more de-constructed work “Primary Colours” represents thin stripes and thick blocks in black, blue, red, yellow on a white ground. Instantly reminiscent of Mondrian’s precise grid method, here too is that sense of symmetry, balance and spatial cohesion. Smartly textured and sharply architectured, Ian Frank’s stylistic designs create a fine sense of peace and harmony. 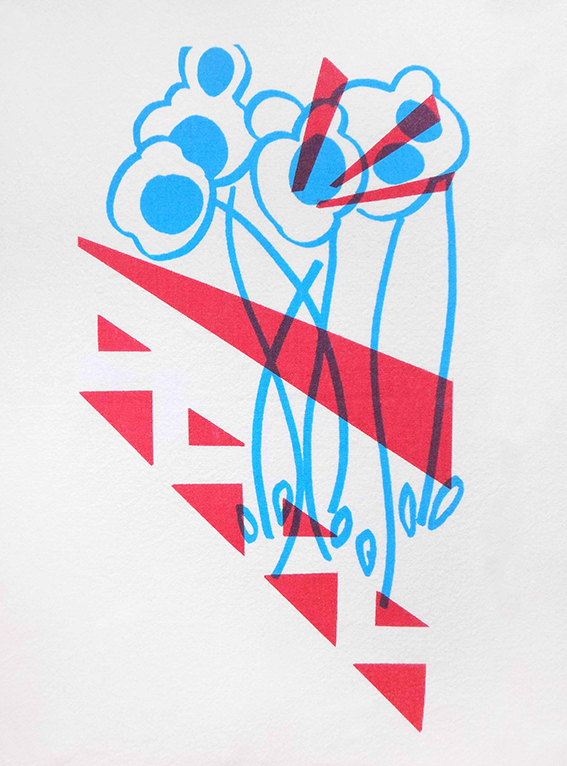 Then head downstairs to view the Prints and Artist books by John Taylor, whose visual language through shape, form, colour and line is most imaginative crafted with meticulous detail. 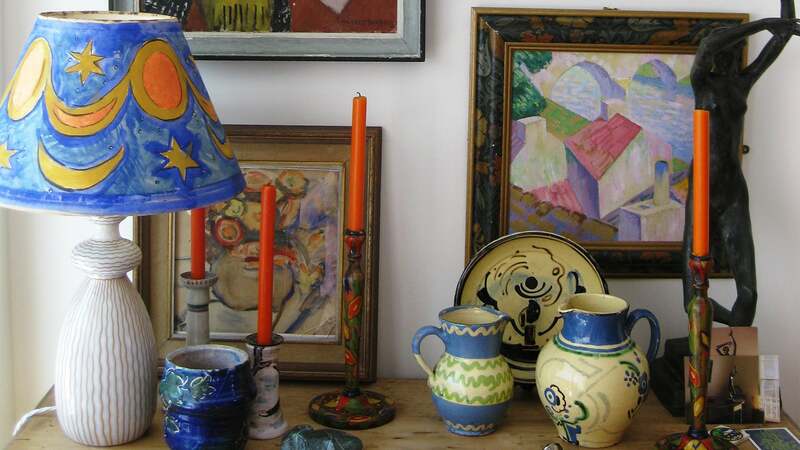 Formerly a landscape gardener, there is an underlying yet subtle theme of the natural world. 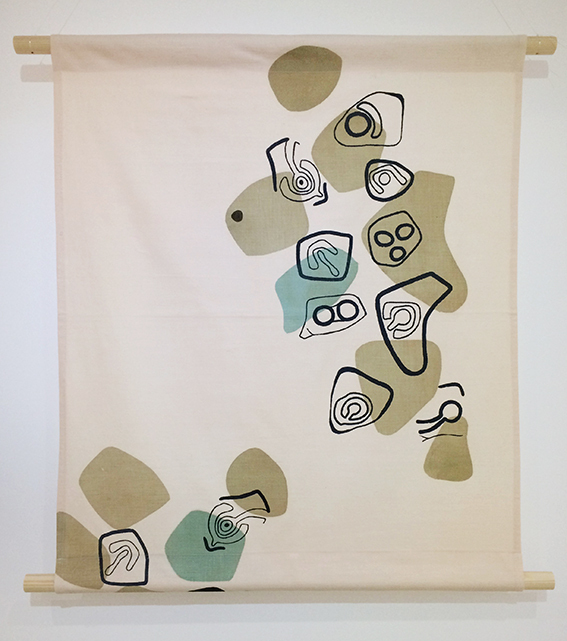 “Ancient Marks” based on cave paintings, is a patterned print on cotton, a swirl of curving crescent moons in shades of olive green and soft blue dotted with black ink calligraphy: one could also envisage a sketchy layout of a garden with borders and ponds. In “Coloured Streamers like Flowers” the imagery is more realistically representational than other more abstract designs such as these floating. light as air, balloon circles in Alignment. These immediately remind me of the Omega Workshop artwork. 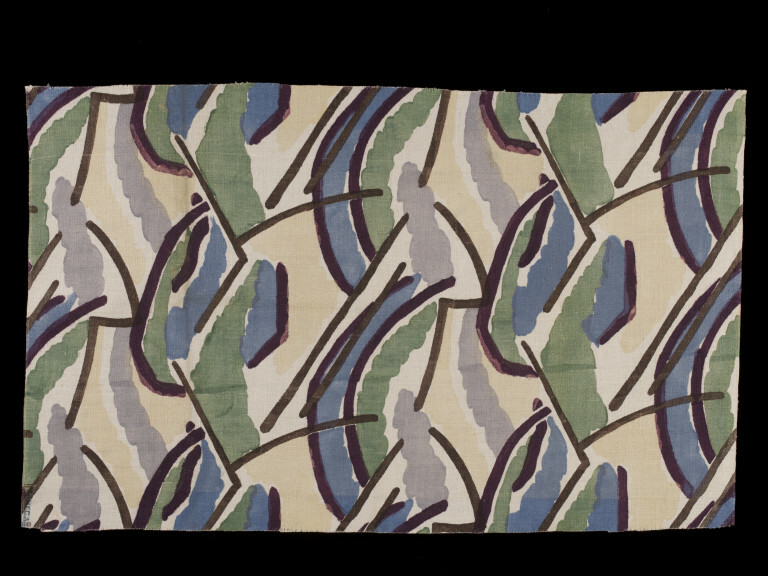 Established in 1913 by Roger Fry, Vanessa Bell (Virginia Woolf’s sister), and Duncan Grant, this experimental collective brought avant-garde art into domestic designs for decorative rugs, linens, ceramics, furniture and fashion. The fact that Taylor’s artworks are printed on cotton, the pretty patterns would be perfect (and popular! ), for designer homeware fabrics – blinds, curtains and also wallpaper – in the innovative manner of the Omega workshop. 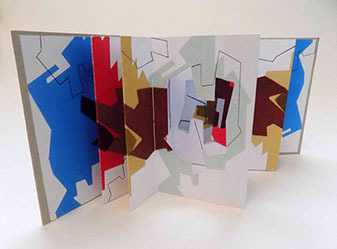 Taylor is also interested in the layering approach of paper crafts, enjoying the complex construction of Artist Books depicting colourful geometric shapes from miniature scale to an extended cardboard concertina of pages like a child;s pop up picture book. This neatly curated, inspirational exhibition contrasts Frank’s dynamic designs with Taylor’s quietly composed prints, as well as complementing their distinctive, decorative styles and aesthetic vision. 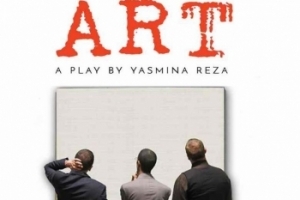 As in the play ART – beautiful not blank! Re:Shape – Re:Colour runs from 17 February – 8 March, 2018 Mon-Fri, 11-5; Sat-Sun, 11-4. Musselburgh is a charming, historic market town named after the mussel beds along the shore of the Firth of Forth. 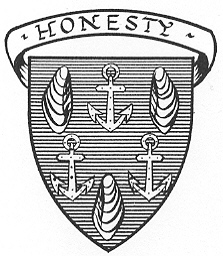 The Coat of Arms depicts three mussels and three anchors referring to the 12th century fishing port – still a prime spot for landing seafood today. As child, my family visited North Berwick holidays as well as regular day trips to the beaches at Yellowcraigs, Longniddry and Gullane. We would never drive through Musselburgh without stopping for ice-cream at “Luca’s” which has a fascinating heritage: Luca Scappaticcio left his home in Cassino, Italy and moved to Scotland in the 1890s, working as a hotel chef which inspired him to create his own special ice-cream. In 1908, he and his wife Anastasia opened their first ice cream parlour in Musselburgh. 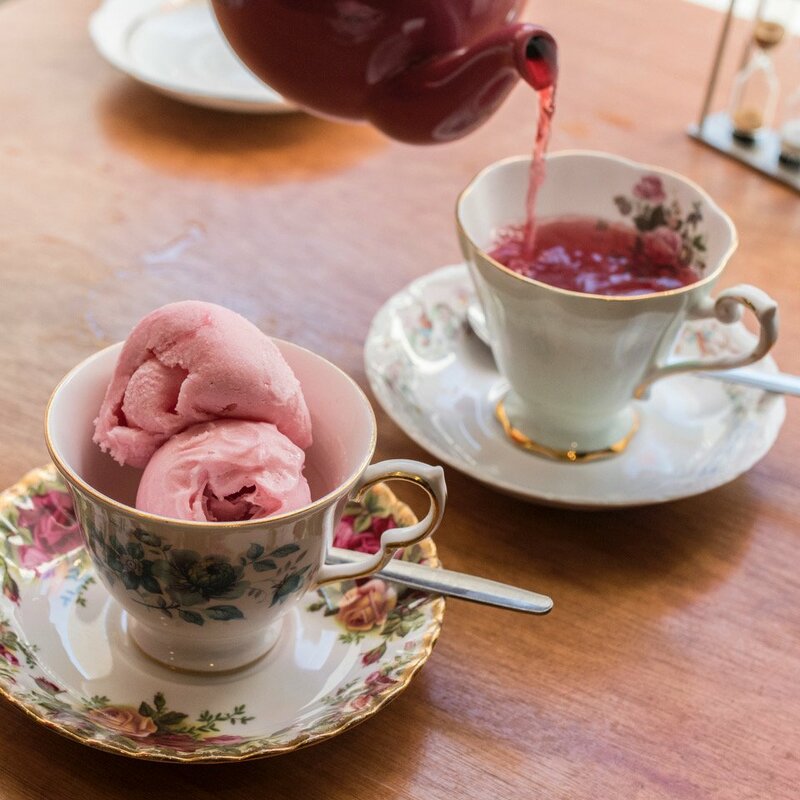 It is probably, 110 years later, the creamiest ice-cream you may ever taste. 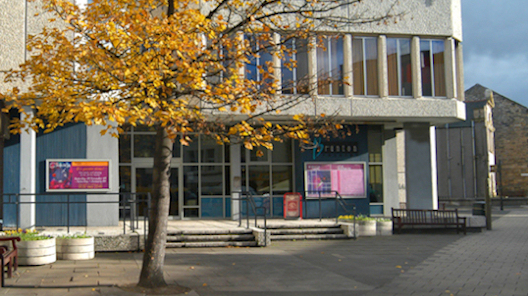 Another reason to visit Musselburgh is The Brunton Hall, a well established Theatre, staging a year round programme of drama, comedy, music, dance, children’s shows, Christmas pantomime and films. There are two well designed venues which canm be transformed into function halls for private and corporate events, weddings, dinners and conferences. The Bistro at Brunton Hall is a very popular place for coffee and cake, soup and sandwiches, lunch or evening meal. It was founded in 2006 by two friends, Norma Buchan and Zandra Borthwick as an innovative development from their successful catering business. 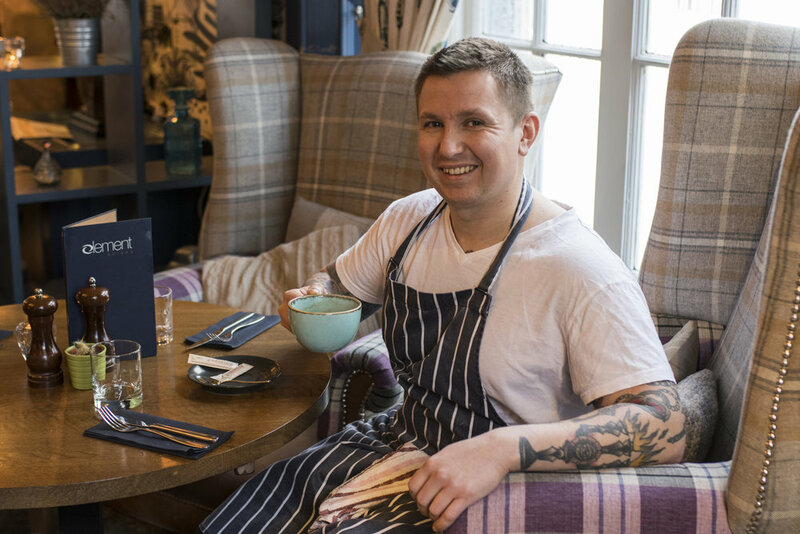 They manage a large team including Head Chef Ron Park and his kitchen brigade as well as the front of house waiting staff. Before a marvellous production of Noel Coward’s “Private Lives” by the London Classic Theatre Company, Ken and I arrived at 5.45pm to enjoy a pre-theatre supper. The reasonably priced menu (£11,00/16.95/£19.95 : 1/2 / 3 courses), offers a choice of fish, meat and vegetarian starters and main courses, emphasising fresh, local seasonal produce and creative homely dishes. 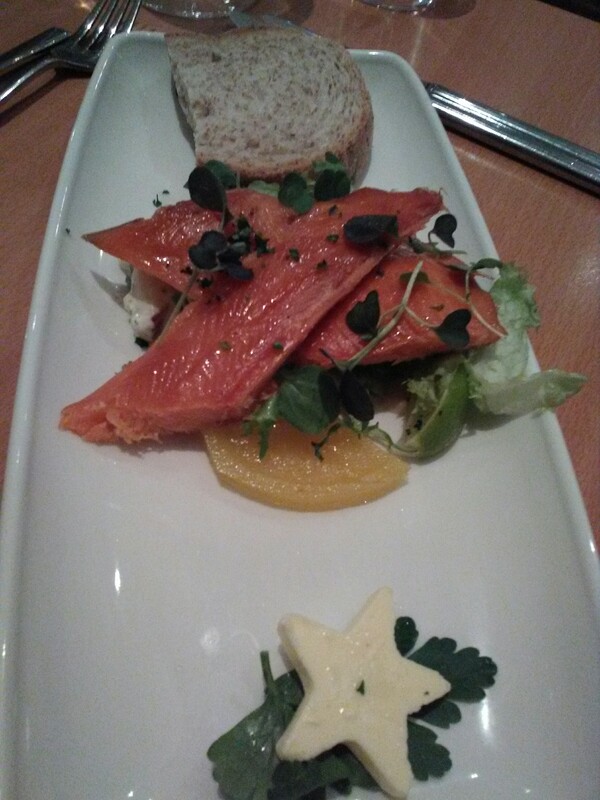 First a large bowl of Cauliflower soup with chunky brown bread for Ken, while my Belhaven Smoked Trout on a nest of delicious roasted golden yellow beetroot and salad leaves. The Wine list is well selected with House Wine (Chilean Sauvignon Blanc & Merlot) priced at £4.00 (175 ml glass) and £15 (bottle). Mini bottles of wine (18.7cl) is a great idea too, as well as Baby Prosecco for one. Beers and ciders too. With our meal, we sipped a crisp, ice cold South African Chenin Blanc. 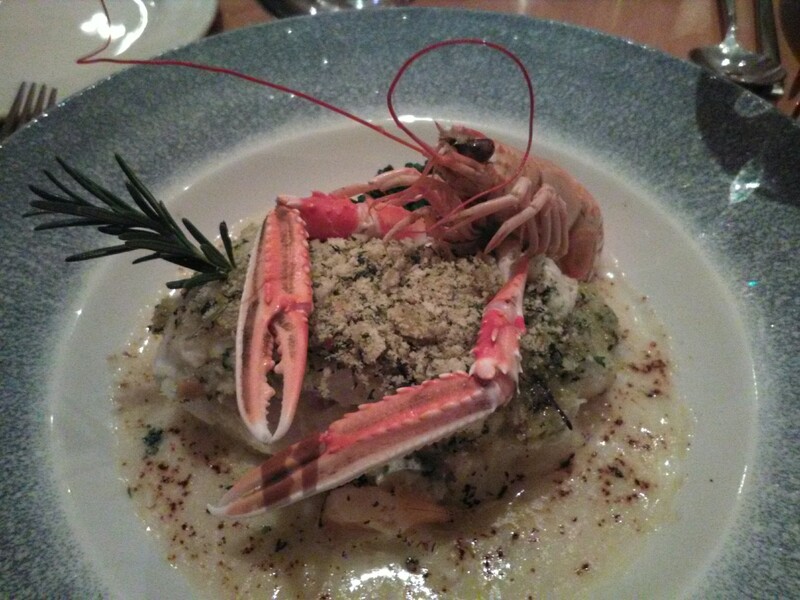 Time for the next course: Coley Fillet with a herb crust, drizzled with a seafood Thermidor sauce on a mound of mashed potato, all artistically presented (as shown here), with a cute wee prawn perched on the top. The vegetarian option for me was simply perfect – a tasty nut roast smothered in a red pepper coulis and a baked, soft and fluffy sweet potato. These were both generous portions of hearty good food. No dessert for us but there was Rhubarb and Ginger crème brulee or Cheesecake. The Bistro serves Breakfast, (croissants, rolls, scrambled eggs – 9am – 12 noon), morning coffee, Lunch – ranging from Soup & sandwiches, to Haddock and chips, Burgers, Macaroni Cheese etc., traditional Afternoon tea, (2pm – 4pm), pre-theatre supper and also early evening meals with an a la carte menu. On the night we were there, The Bistro was bustling with theatre goers – the most relaxing way to start an evening out. 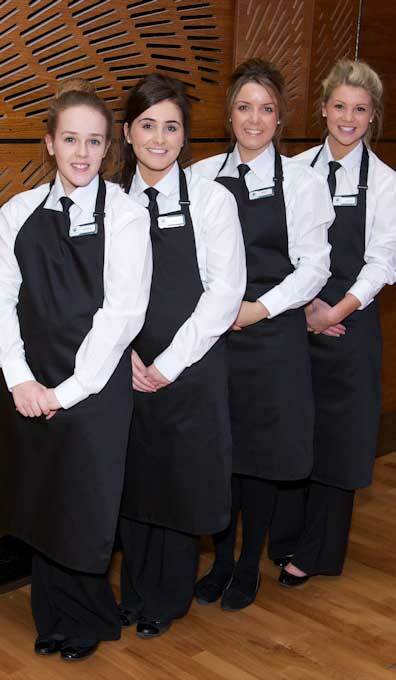 The friendly attentive team of waiters rushed around ensuring everyone was fed and watered before curtain up. With a warm, welcoming atmosphere, this is a popular social hub for the community and visitors to town, day and night. So, if you are booking tickets at the Brunton Theatre, coming to Musselburgh for a round of golf or attending a Race meeting, do call in to The Bistro for a superb choice of seriously good food and bar drinks. Be sure to book a table in advance! Happy diners at The Bistro. “We are regular visitors to The Brunton Bistro at lunchtime. 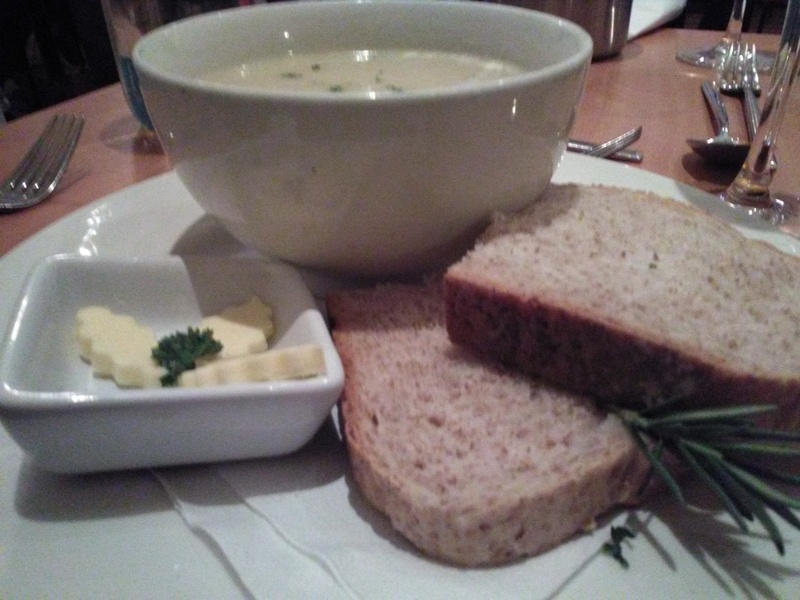 The soups are the star of the show, full of flavour and wholesome. 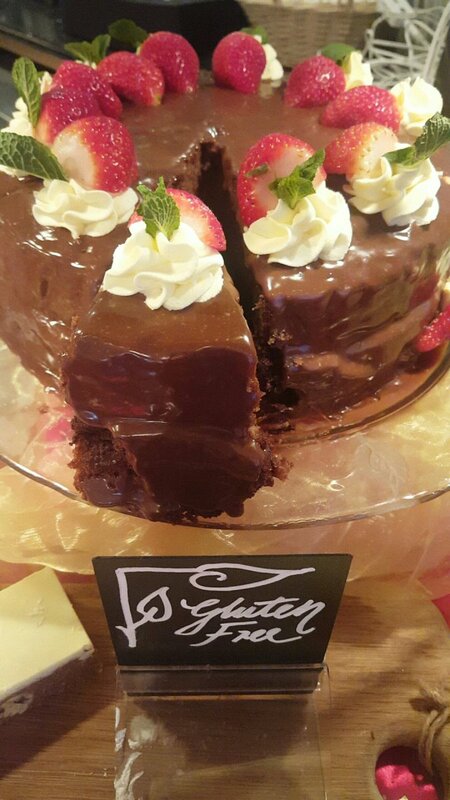 Freshly made sandwiches as well as scones and cakes. A selection of substantial main meals too. Excellent”. Sundays – closed except on performance days. The theme of the 2016 Festival was to entice people to try something new and it’s certainly the motto again with the focus on new places to eat as well as great global cuisine. 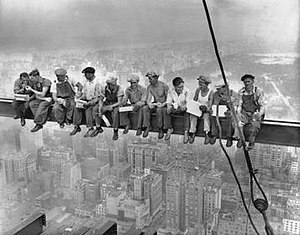 To promote the launch of the Festival, a group of chefs and restaurateurs paid homage to the iconic New York ‘Lunch Atop a Skyscraper’ ..
…transported to a girder here with a backdrop of the city’s architectural landmarks. 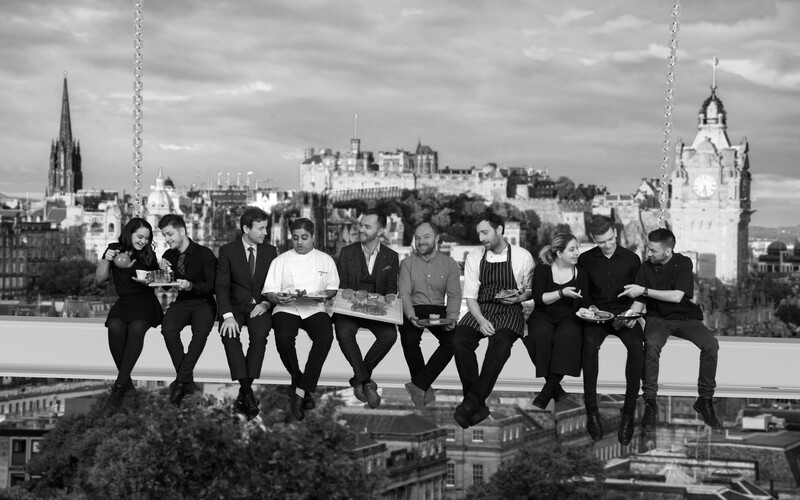 The Edinburgh Retaurant Festival line up shows Kandice Rosser, eteaket, Andrei Doja, Gusto, Eric Garnier, The Ivy on the Square, Anand Ghotikar, Dishoom, Jamie Robertson, Gaucho, Mateusz Warzocha, 1780, Raymond Sutherland, Badger & Co. Natasha Goldie, Las Iguanas, Fraser Spratt, Jenners and Dawid Rompca, Wahaca. The Festival runs from 5 – 25 February 2018, with a fabulous programme of food and drink events to tempt your taste buds around a couple of dozen or so cool, contemporary and classy restaurants. Scottish, British, Indian, Italian, Thai, South American and hot Mexican flavours can be sampled around town from Amarone – via Browns, Chaophraya, Contini, Element, Hard Rock Cafe, Rosehip, Tigerlily, Taco Mazama – to the Voodoo Rooms. Each partner restaurant is offering special discounts, Festival menus, speciality cocktails and delectable desserts. Good food for gourmands is complemented by inventive cocktails, wine, beer, fine teas and tipples along the way. 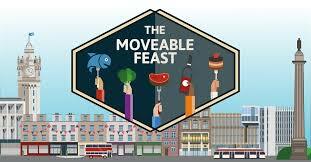 The Moveable Feast is back after sell out success last time. Embark on a magical mystery tour on foot to enjoy five delicious courses touring around five locations – starting with fizz and canapés, then starter, main course, dessert and a final nightcap, served up around the city centre. The feast sets off on 6, 13 and 20 February. Advance Booking essential. 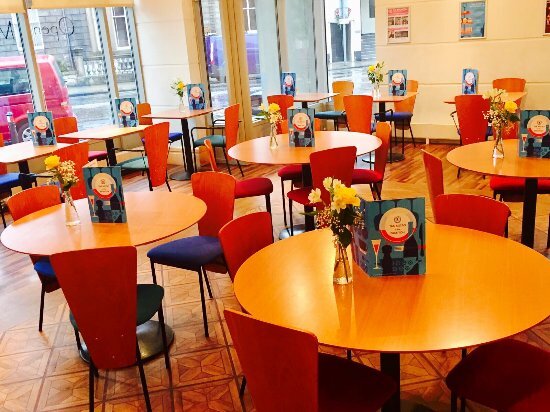 New for this year is the Secret Dining Experience on 15 February where lucky guests who grabbed a ticket, meet at St. Andrew Square and are then escorted to the undisclosed and surprising dining venue. 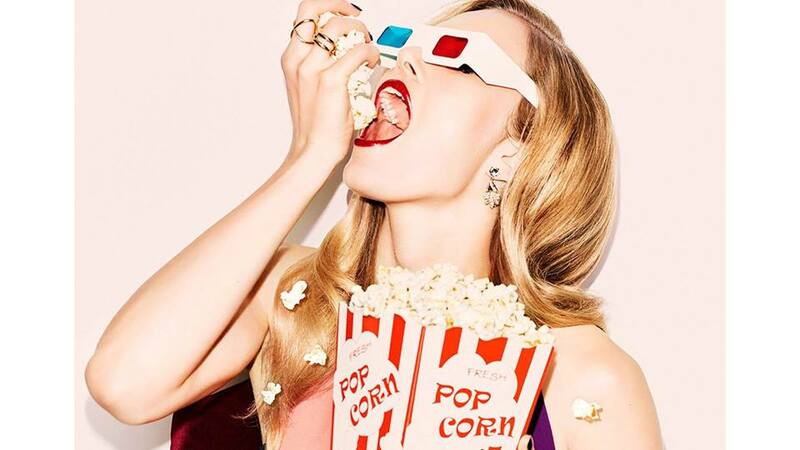 An innovative Pop Up “Movies and Shakers” cinema will be on offer at Harvey Nichols Forth Floor combining a Movie and a Meal with a cocktail, followed by a sport themed film: Jerry Maguire (13 February) and Cool Runnings (27 February ). And, of course, a bucket of Pop Corn, is supplied. To ring the changes, join in the Cooking with Beer Dining Experience. 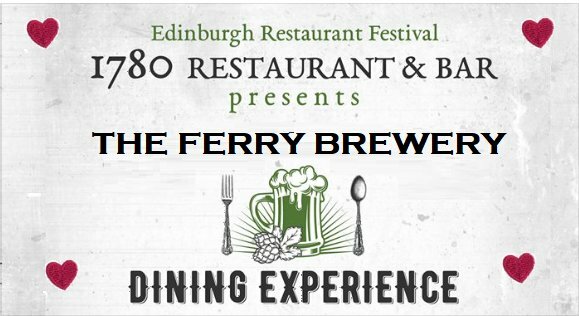 1780 Restaurant on Rose Street is joining forces with The Ferry Brewery on 15 February and with Cross Borders Brewing on 22 February, when you can tuck in to a 3 course meal or selection of tapas, with the food expertly paired with selected beers and craft ales. 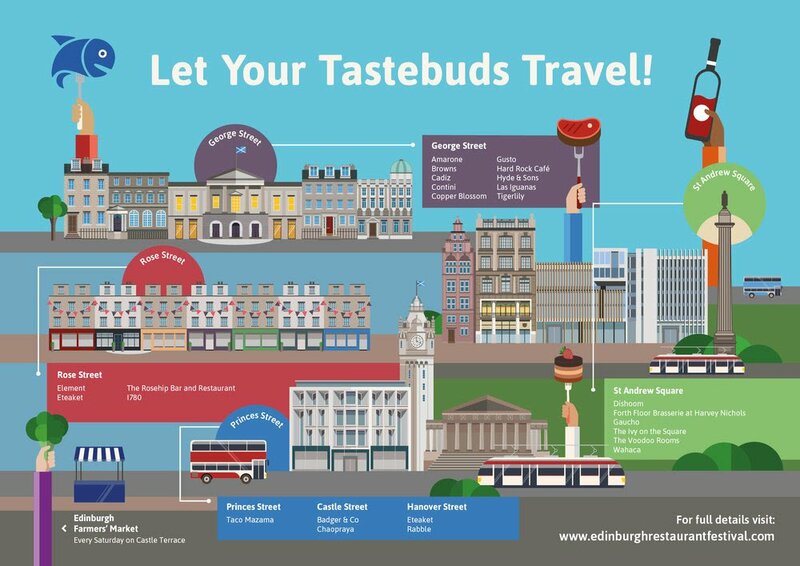 The Festival map covers a wonderful selection of eateries around St. Andrew Square, Rose Street, George Street and Princes Street. 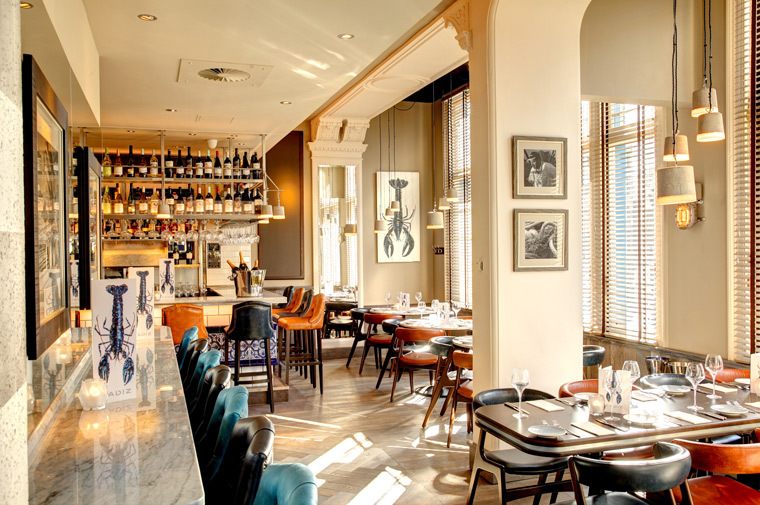 Element offers a Scottish themed menu for the Edinburgh Restaurant Festival: £20 for 2 courses, £25 for 3 courses, with an optional whisky flight per course. Indulge in a complimentary Bomboloni (home made doughnut flavoured with caramel and limoncello) for dessert when ordering a starter and main course. 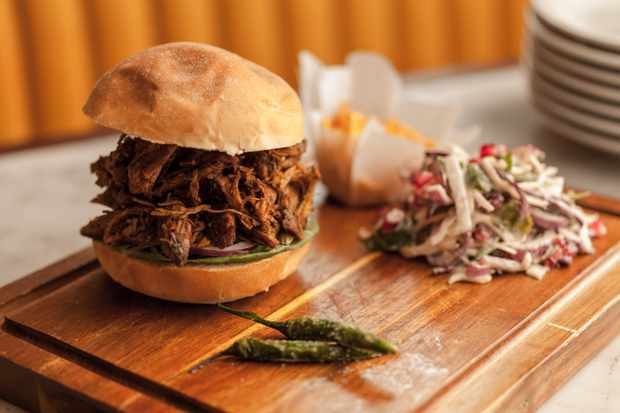 Experience the Lamb Raan Bun special .. juicy, slow-cooked pulled Scottish lamb in a soft sourdough bun or book a party table for cocktails in the Permit Room bar. Badger & Co: “The curious name is from “Wind in the Willows,” the riverbank tales about Toad, Rat, Mole and Badger, by Kenneth Grahame who was born at this address on 8th March 1859. This elegant Townhouse features a sequence of colourfully designed salons – Bar, cosy Lounge and stylish Dining Room. Homely, classic British dishes + cocktails, wines, beer = fictionally inspired feast”. 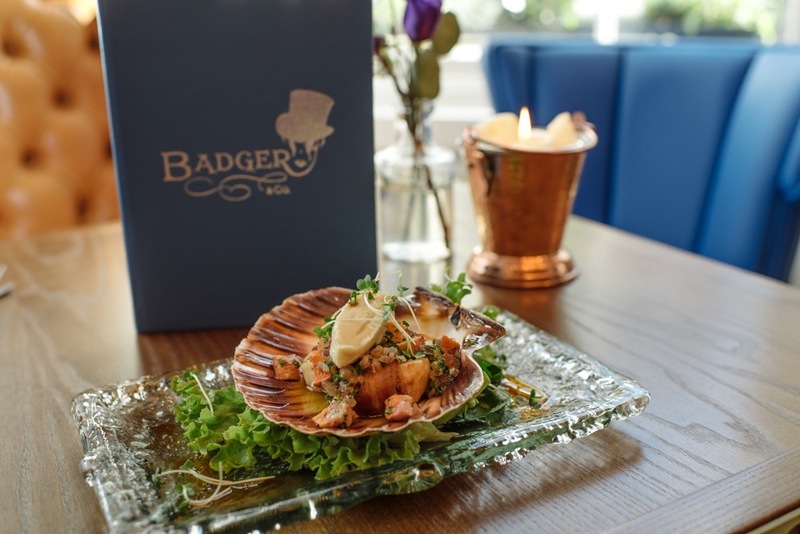 Traditional dishes at Badger & Co. 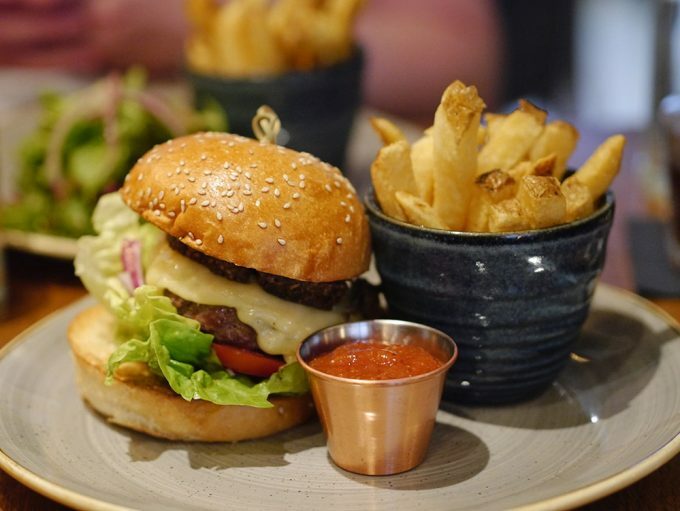 This is an appetising Festival for Foodies to celebrate the flourishing ‘dining out’ atmosphere around the Capital – which boasts more restaurants per head of population than any other city in the UK. So be inspired to try somewhere new and exciting different cuisines during the Festival .. and through the year. “Elementary, my dear Watson” – Sherlock Holmes would surely be impressed by the fine sense of tradition at Element. The pedestrianised, cobbled Rose Street is the place for a leisurely stroll, lined with smart boutiques, bistros and bars. Element (@110), offers a casually sophisticated ambience with a true sense of tradition in its design and decor. Step inside to the spacious Pub area, with its island bar, high tables and stools, perfect for a couple of pints or G&T. Walk through to the Dining area – stunningly designed like a cosy lounge of a Country House hotel: blue panelled walls, tweed armchairs, polished wood, vintage curios and art deco lamps. A large Mural of Edinburgh’s iconic cityscape features Greyfriars Bobby, Arthur’s Seat and Royal Mile. 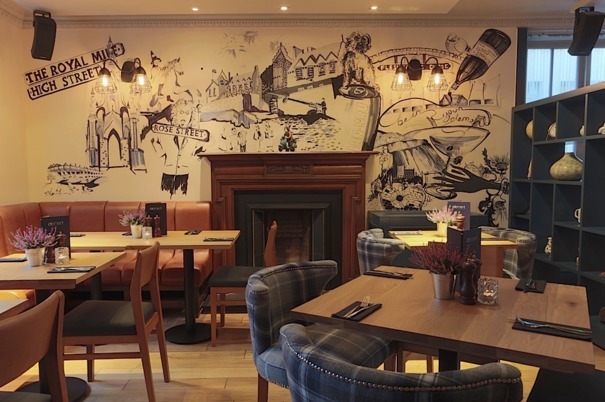 This is a hidden gem in the city centre, for a relaxing pit stop over a feast of good homely food and your favourite tipple or two – all day Brunch and traditional Sunday Roast lunch are a speciality. Relaxing comfortably in two high backed wing armchairs here, you can imagine Sherlock Holmes and Dr. Watson, tete a tete, to discuss their latest crime busting mission, over a platter of Venison Stew and a Highland single malt. The furnishings are well designed to entice diners to linger longer for a leisurely, lazy meal. Ken and I settle down to browse the All Day Menu with the option of Lunch (soup, Ploughman’s platter, Croque Monsieur, Chicken, homely puddings), as well as Brunch, served 10am to 5pm daily which is a most sensible and welcome idea. Classic and contemporary dishes galore, such as the full Scottish (Crombie’s sausages, black pudding, haggis, egg, tattie scone, et al), and Eggs Benedict any which way you fancy with ham, smoked salmon or spinach. After Dry January and Veganuary to encourage us all to start a fitness regime, Ken ordered the Vegan Breakfast: a healthy combination of meat free sausages, home made baked beans, vegan haggis, mushrooms, tomato and a mound of scrambled tofu. This has the pale yellow colour and fluffy texture of the real egg version, and was very tasty indeed. I selected Smashed Avocado jazzed up with chipotle flakes on toast, topped with two poached eggs (illustrated below). Simply delectable– the creamy, vibrant green superfood spread thickly on chunky ciabatta toast, over which drizzles the rich golden yolk. Other “On Toast” options are ‘hummus, roasted red pepper, halloumi’, ‘scrambled egg and smoked salmon’. 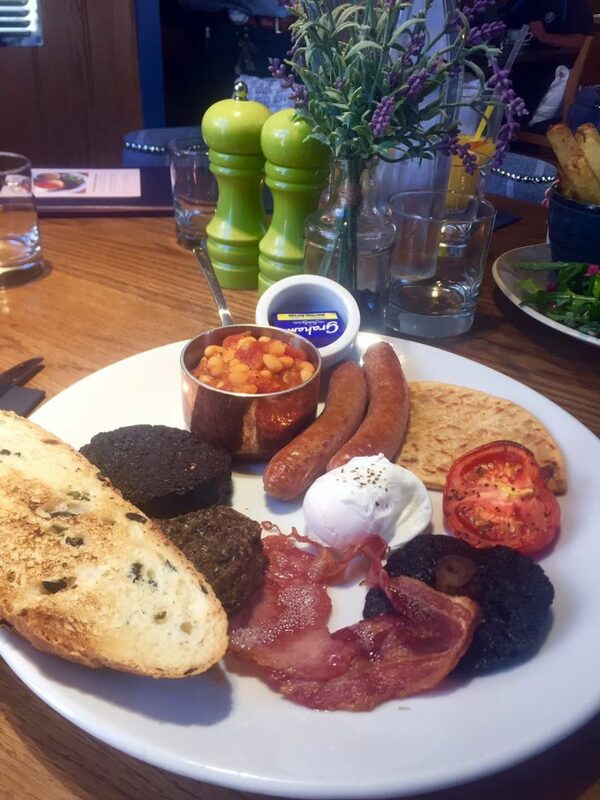 The flexible menu means you can mix and match and add sides to create your own delicious brekkie feast – such as bacon, black pudding, sausage as well as Chips – irresistable!. So we shared a portion of long thick fries, crispy skin coating the soft flaky potato. 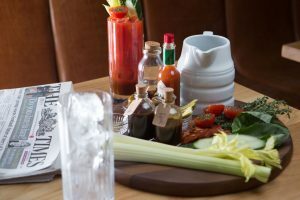 Bubbly and Brunch cocktails are recommended including the essential Bloody Mary as the ideal accompaniment. This is mixed according to your personal taste, with a 5 – 10, medium to hot Tabasco score. After 5pm, the dinner menu takes over with choice of Starters (Thai fish cake, ham hock terrine), and hearty mains – flat iron steak, cassoulet, venison stew, Haddock and chips, Beef burgers, served with optional bacon, cheese or haggis; Apple crumble, ice-creams. The wine list is well priced from around £18 a bottle (South African Chenin Blanc/ Merlot), international beers, (Scotland, Spain, Italy, Belgium, Mexico), spirits and house cocktails. “The One o’clock Gun” sounds like a colourful concoction of Bourbon, Laphroaig, Torrino Rosso, Campari, which will certainly fire a shot! Sunday is very popular here for a traditional Roast, complete with the papers and chill out music on the soundtrack. 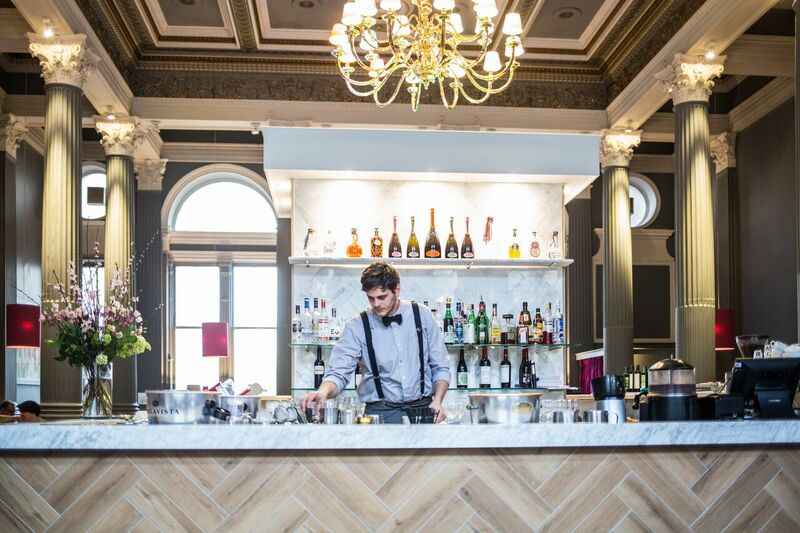 Morning, noon and night, you will be in your element here, to imaginatively created dishes, reinvented pub favourites and cool cocktails in a casually sophisticated wine bar-gastropub environment. 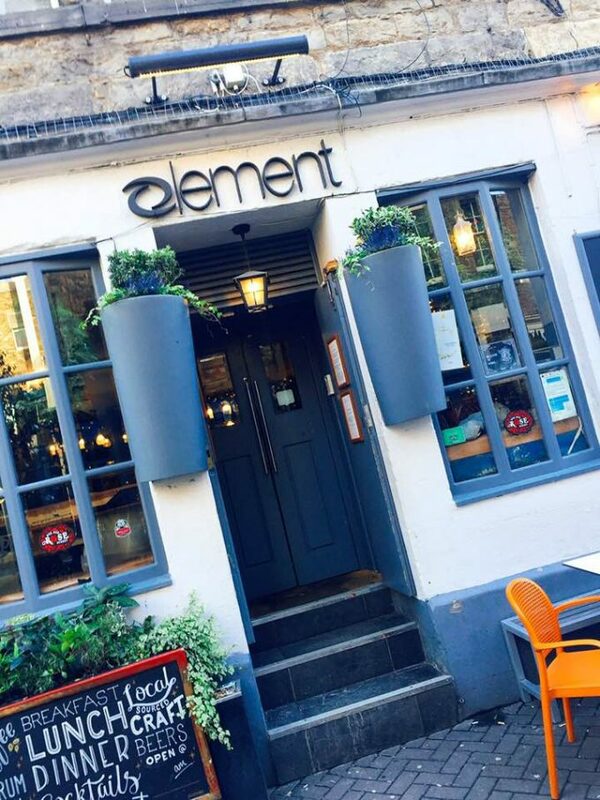 Element is part of the Edinburgh Restaurant Festival from 5 – 25 February, 2018, offering a special menu – £20 for 2 courses, £25 for 3 courses celebrating Scottish cuisine with an optional whisky flight per course.